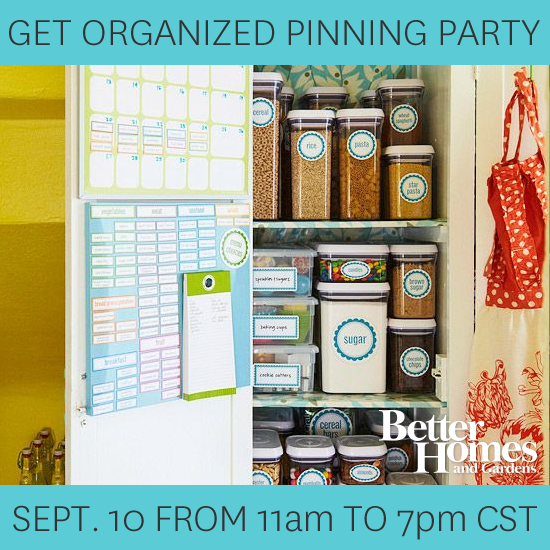 Join Me for the Better Homes & Gardens “Get Organized” Pinning Party! I am excited to be joining Better Homes & Gardens and some of my favorite bloggers to pin our favorite organization ideas around the web tomorrow, and I hope you can join in on the fun! Starting tomorrow Sept. 10 at 11am CST, this BHG Pinterest board will be filled with inspiration for organizing your home and life! This party couldn’t come at a better time for me – our new home has been the motivation I needed to tackle the clutter and create organization where none existed previously. So far, I’ve tackled the girls’ bedroom closet, our kitchen desk area, and most recently all my craft storage. Next up on the list is organizing the pantry, laundry room and our master bedroom closet! I can’t wait to get some great ideas tomorrow – if you’re on Pinterest tomorrow be sure to check out the pinning party here.